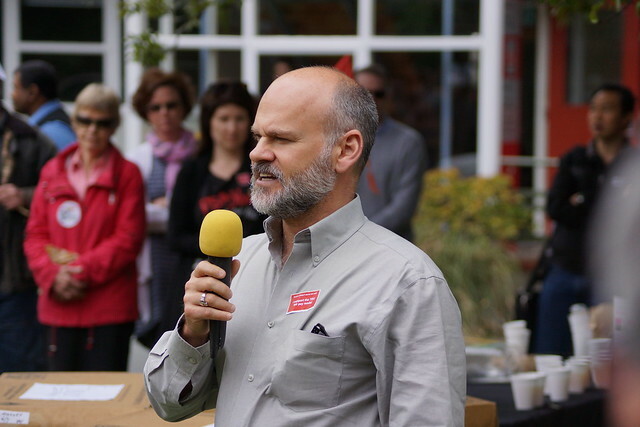 Stuart McCutcheon, the University of Auckland’s vice-chancellor appeared surprised to receive a visit yesterday afternoon from over a hundred union members seeking a fair, negotiated pay rise. TEU and other unions representing working people at the university organised a rally in the centre of the campus where they called for the vice-chancellor to negotiate pay. People at the rally decided they wanted to deliver their message to the vice-chancellor in person. They marched to his office and handed over a pile of postcards calling on McCutcheon to make a pay offer. The unions presented their pay claim, as part of collective agreement negotiations, five months ago and are still waiting for a responding offer from McCutcheon. TEU members also want to replace the old performance pay system, Evolve, with a fairer, more modern system. Under the current system, only one-third of professional staff got any sort of ‘merit’ based payment last year. Of that third, only one-third got an increase with the rest receiving one-off bonuses. TEU organiser Enzo Giordani said seeing that many union people in the sunshine sends a clear message to the vice-chancellor that his community expects change. See photos of the rally here.